This lasagna was born from leftover ravioli filling I made during a ladies night cooking feast at my house. 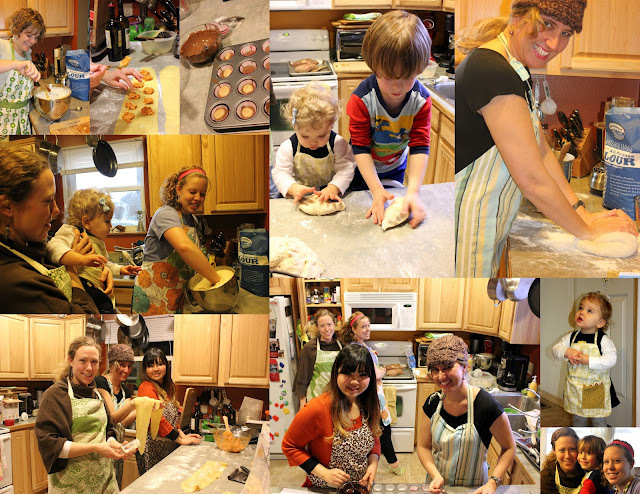 I had some ladies over to teach them how to bake bread and make ravioli and what a blast we had. I love it when friends come pounding at my door to infiltrate my house for a night of cooking, laughter and wine. When my dear friend Danesa asked if she and a couple of her friends could come over and learn to a cook a few things with me, how could I say no? I pondered over what we should make and finally decided on focaccia bread and a sweet potato ravioli I'd been drooling over for awhile on Picture Perfect Meals. I picked these items because people often think that making bread from scratch if hard or even impossible and I always love opening up people's eyes to how easy it really can be. The same goes for pasta, although it helps tremendously to have a pasta roller which, perhaps, everyone doesn't have in their kitchen. The night was a wild success and a wild amount of fun. Seriously, with all these awesome ladies and kiddos taking over the kitchen, how could it not have been a blast? Plus, the food was out of this world and everyone was pretty impressed in what we rolled out of the kitchen in only, ahem, five short hours. The next day I found myself staring at an obnoxious amount of sweet potato ravioli filling and wondering what the heck to do with it. I am very much a recipe cook, and have only recently started branching out and trying a few of my own creations. One thing I do know how to make recipeless, and darn good too, is cream sauce. I also know that brown butter makes everything taste better. Could I possibly turn this into a brown butter cream sauce? I am positive that God was speaking to me at this point, because who else could have put such a divine thought into my head? Woo wee, am I glad I listened closely to that voice and made this sauce. I'm not gonna lie, this lasagna is rich, but its that kind of rich that melts in your mouth and tells your whole heart, body and soul that life is soooo-ooo-ooo good. Make the filling: Preheat oven to 425F. Scrub the sweet potatoes and then prick them all over with the tines of a fork. Place on a baking sheet and bake in the oven for 45-55 minutes, or until a fork inserted in the middle passes easily through. Allow to cool completely, then cut in half and scoop the middle out into a large bowl. Add all remaining filling ingredients, except 1/4 cup parmesan and mozzarella, and stir to thoroughly combine. Set aside. Make the noodles: Combine all ingredients in a food processor and process until it forms a soft shaggy dough. Dump out onto the counter and knead into a ball. If not using immediately, wrap tightly in plastic wrap and store in the fridge. Cut the dough in quarters and, taking one section at a time, run through a pasta roller to the third thinnest setting (this is a 6 on my KitchenAid roller). Lay on a generously floured counter. Repeat with remaining dough pieces. Just before assembling the lasagna, bring a large pot of water to a boil. Cook lasagna noodles in boiling water for 2-3 minutes, until barely cooked through (they'll finish cooking in the oven). Drain. Make the Sauce: In a medium saucepan, melt butter over medium heat until brown and the butter has a nutty fragrance, 6-8 minutes. Watch the butter carefully to avoid burning and add the flour when the butter has just turned brown. Whisk the butter and flour constantly for one minute, then add the milk. Whisk the milk constantly over medium heat until the sauce starts to thicken, 7-8 minutes. When the sauce has thickened, remove from the heat and stir in the salt. Assemble the lasagna: Set oven temperature to 375F. Lightly spray the bottom of a 9 x 13" baking dish with non-stick cooking spray. Spread 1/2 cup cream sauce on the bottom of the baking dish. Layer noodles to cover the bottom of the dish. Spoon half of the sweet potato filling on top of noodles and cover with 1/2 cup sauce. Repeat with one more noodle, sweet potato, sauce layer and then add another layer of noodles to the top. Spoon the remaining sauce on top of the noddles then sprinkle with reserved 1/4 cup parmesan and mozzarella. Bake covered with tin foil for 20 minutes. Remove the foil and bake an additional 15-20 minutes or until the top is lightly browned and bubbly. What fun to be cooking with friends! The lasagna looks wonderful! Terrific recipe and great was to use up the left overs. Sounds delicious. what a fun idea to have a cooking party with the ladies. This is a very creative dish! I imagine the get together was a blast too. All the pictures tell me that you should do the get together at least once a month. Especially if this group inspires you to make dishes such as this one. Well done! Oh my word. This is the worlds most perfect meal. And, I don't think your daughter could be any cuter. Such a little punkin'! I'll bet this is delicious. I make a dish with penne and a creamy butternut squash sauce so this is a little similar. Yum! brown butter cream sauce? GENIUS! this sounds absolutely delicious! That looks great! I love the kids in the kitchen. I really really love that, such good helpers! Love what you did with the leftovers -- it's absolutely mouth-watering. This is genius--sweet potatoes have color, flavor, fiber--all a brilliant addition to lasagna filling. Yum! I just had dinner and I'm drooling over this. This is DIVINE. Go girl! Also, I wish I could come over for a cooking class too! This looks amazing, and I love your collage of photos! The elements in this dish are absolutely amazing! I can see from the photos how much fun you had! It is always so nice to share your kitchen and home with friends and exchange ideas, joks, experiences and knowledge! These melting lasagna look extremely mouthwatering! What a creamy, savory lasagna! You have the best recipes! Good grief this sounds delicious! I absolutely love sweet potato in pasta's and add brown butter?! Heaven! very creative, the brown butter cream sauce sounds fantastic! What a fun night with the ladies! Great use of the leftovers too. The lasagna looks incredible! I love this idea for lasagna!! Whenever a few of my friends come over to bake with me, we always end up spending the whole day in the kitchen or watching TV or just hanging out. Catching up is half the fun (the other half being the food obviously!). This sweet potato lasagna with brown butter sounds so yummy. What a fun party! How lucky your friends are to have you host something like this. I love your lasagna too! That brown butter sauce sounds incredible! Yum! 1. That picture of Luca and Anna with the dough is awesome. Truly awesome. 2. Love the collage - what program do you use for photo editing? Thanks Hope!!! I know, it was such a kick to watch Anna and Luca going at the dough. They had a blast. We all did! I use Picasa for photo editing. I love it, but do hope to upgrade to something photo-shopish at some point. Picasa is free, so it works for now! Book potential, eh? Like father like daughter? :-) I'll think about it. This looks awesome! ... and, what Anna said! These things are fun, and I find that many youth don't know how to cook anymore.